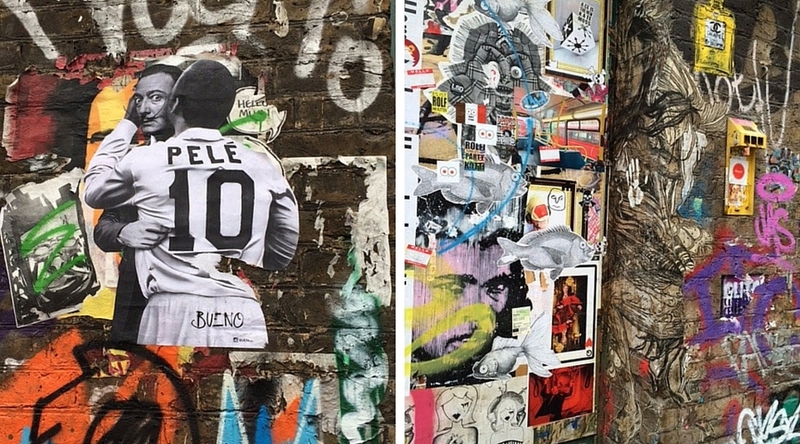 A few weeks ago, after a lovely lunch we wandered around Shoreditch and I was enthralled by the street art. I spotted a tour while admiring some art and decided to book myself on one to learn more about the culture of street art and about the artists themselves. What was really interesting is that pretty much all of the graffiti and street art in Shoreditch is legal as the artists have either asked permission or have been commissioned by shop or building owners. All council property though is a no-go as the council will remove it. In the past, artists had to work at night so that they weren’t spotted but now that they can work legitimately, their style and techniques have vastly improved. This one below is by Dr Zadok, whose work is often characterised by birds, and covers the wall of a listed building. For street artists, any surface of the city can be a canvas. Take Ben Wilson who creates paintings from discarded chewing gum. This one depicts the street it’s on – Great Eastern Street. You can find his work all over the city but particularly on the Millennium Bridge, where there are loads. 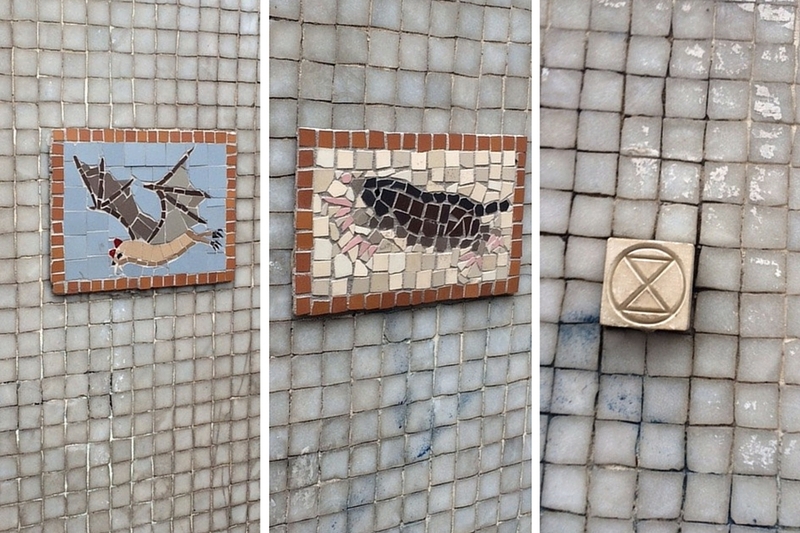 I love mosaics and I’ve spotted a few of Xylo’s work around Southwark. 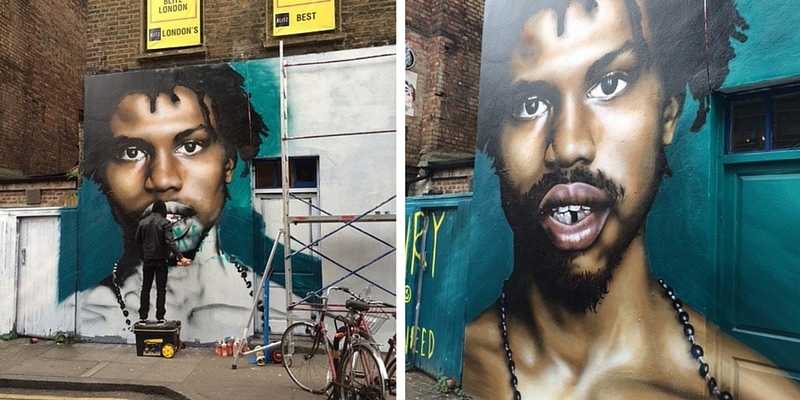 Here are two in Shoreditch – a bat and a mole. I love how with these two he has put them on a tiled wall. Xylo always leaves his signature, which is a tile with a circle and an X- almost like an hourglass. Here’s a selection of sculptures in a wall crevice by Citizen Kane (left) and also Gregos, a French street artist who creates sculptures made from a mould of his face (middle and right). 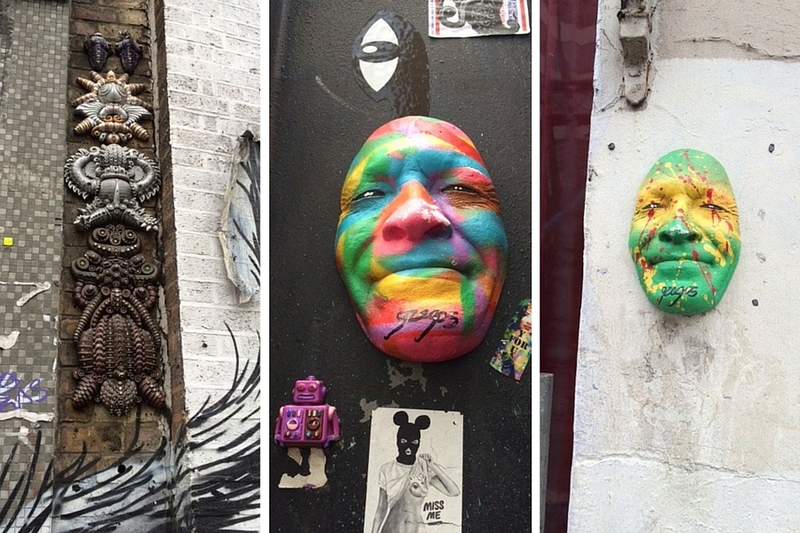 Apparently Shoreditch has 50 of Gregos’s face afixed to buildings! As any surface can be a canvas, is there any better canvas than the boards put up by construction workers? Emiliano explained that it’s the perfect material as it’s flat and isn’t difficult to paint on, like brick is. We were taken to Blackall Street, which is famous for street art and graffiti and when the buildings were demolished to make way for new ones, the artists just went to work on the construction boards. The rule is that they will paint one bit and leave it for a week. If in a week, it’s still there then they paint the rest of the boards. Emiliano said that this particular one was like a picnic in that there were around 20 artists and some had brought their families along as it could only be done over the weekend. 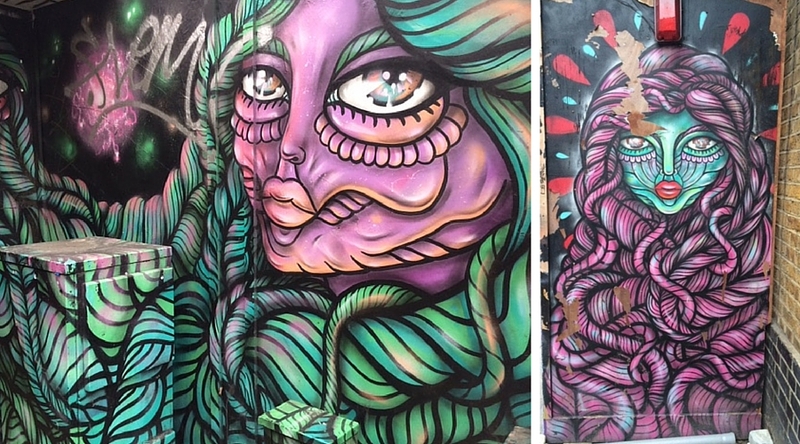 Here’s some of the street art in Blackall Street that’s on the back walls and doors of offices. What I found really interesting was that, as Emiliano told us, street and graffiti artists are all self-taught as there is no graffiti courses or colleges that they can attend. They learn to hone their skill and pick up new techniques by working alongside other artists and they will often collaborate together. Street Art London Tours are also paying for international street artists to come over and leave their mark on the city. In South America, for example, their style is very different as spray paint is expensive so they tend to paint with brushes. Having international artists display their work enriches the street art scene and introduces new cultures to the area. Here’s a collaboration by Mexican artists Fusca (who is a woman and painted the woman in this image) and Mazatl. I really enjoyed the tour and would highly recommend it if you’re interested in art and the artists behind the street art that you see almost everywhere. Many of these artists have works in other cities, such as Berlin, Amsterdam and LA so I’m looking forward to keeping an eye out for them on my travels. For more street art pictures, follow me on Instagram. 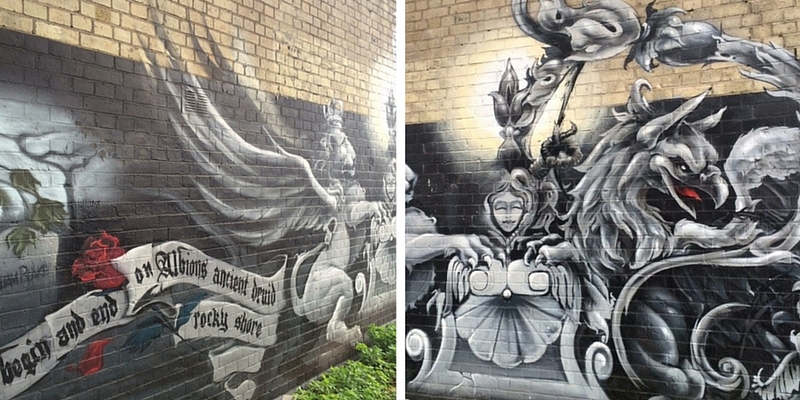 Remember I said that I was inspired to go on a tour after seeing street art while exploring Shoreditch? Well I was lucky enough to see an artist in action that day and here’s the finished product that I had a look at today after the tour. Do you love street art too? Yes, I do! And these are awesome!! Great art form, really good read! Thanks Aaron, really glad you liked the post! Great pictures. I love street art, and particularly enjoy a wander around Bristol admiring it! Oh my, the talent in London is amazing! Thank you for sharing. I’m going to London this weekend, you’ve inspired me to have an explore if I get some spare time! I am in love with Shoreditch! I actually have a travel video I made when I was there! It is a great area. So vibrant and full of fascinating characters! Discarded chewing gum? Wowl! Talk about making lemonade out of lemons. Love it! !